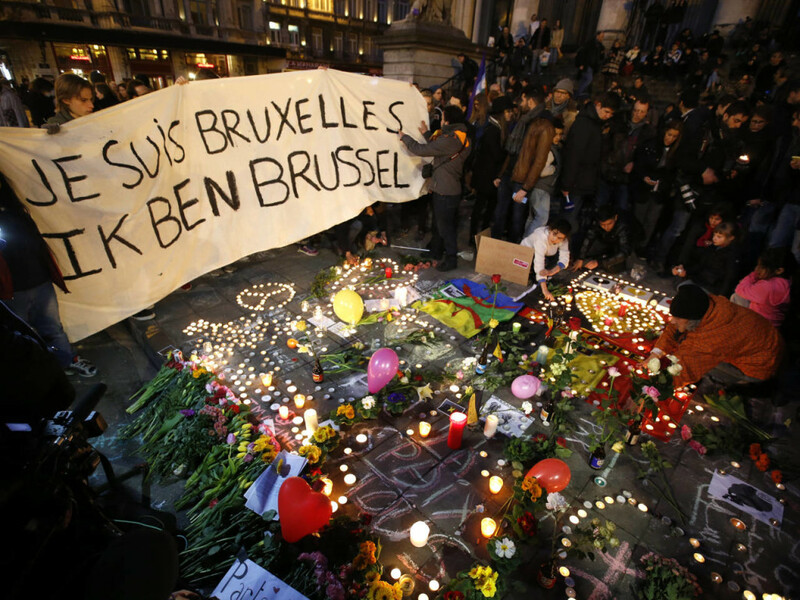 Mourning for Brussels or Bashing Israel? You are here: Home / Antisemitism / Mourning for Brussels or Bashing Israel? On March 22, 2016 the world witnessed the deadliest terrorist attack on Belgian soil. The concerted bombings at the Brussels Airport and the Maalbeek Metro station claimed the lives of over 30 people and injured over 300. Belgium has been in the news lately because of its connection to some of the 2015 terror attacks in France. I thought that the Charlie Hebdo terrorist attack of January 2015 was going to be a wake-up call for France in particular, and Europe in general. It certainly looked like French authorities had finally committed to defending their citizens and even more so, their own Jewish community. Then November 13, 2015 came around and France was hit again, this time 130 people died and 368 were injured. Was France caught off-guard? What about Belgium in March 2016? I think that we are way passed the wake-up call stage for Europe. For reasons that defy all logic, the Islamic State’s appeal to a young generation of Europeans is growing fast, and we are starting to see the fruit of IS propaganda and recruitment. Terrorism “à la ISIS” has gone global. While all politically correct people continue to dislike profiling and segregating, Islamic terror is simply becoming a redundant phrase. Terror is Islamic and Islamism is terror. Please prove me otherwise! In the midst of a tragedy like this recent terror attack, people seem to cling together. Religious or not, Belgians or not, people are coming together one more time in a sobering demonstration of solidarity. The human spirit still can prevail. Photos of victims, candle vigils and a sea of international symbols and flags can be spotted in Belgium. People are organizing peaceful gatherings akin to the historic Paris March of January 2015. So, we might be passed the wake-up call stage, but people are still people and tragedy–as devastating as it might be–can be bonding. Today is the time for putting our differences aside and holding hands against terrorism of any kind. Well, apparently, this is true for all people except those who are pro-Palestinian. In a despicable display of hatred that is more politically targeted than anything else, we have seen several people come to vigils and either tear or remove Israeli flags to only cover them with a Palestinian flag. What in the world does this have to do with the Islamic State attacking Belgium? Absolutely nothing! At a time when the world mourns the innocent victims of yet another terrorist attack, some people have the chutzpah to barge in and inject their antisemitic venom with no apparent shame whatsoever. The hatred of Israel is so deep that pro-Palestinian people cannot even stomach the mere sight of and Israeli flag at a peace vigil for the Brussels victims. In some cases, they will even go as far as burning the flag and chanting anti-Israel slogans. Are they insinuating that the terrorist attacks were Israel’s fault? seriously! What is even more disturbing is the fact that these acts don’t seem to phase anyone in the media. A woman in a Hijab and wearing a Palestinian scarf is seen tearing an Israeli flag apart and then covering the remains with the Palestinian flag as people all around her watch in silence. Are they clueless or careless? How about the commentators on that French speaking TV who are talking about an upcoming gathering for a memorial as they show the woman live and not one of them seem to notice or care? Even though the whole world knows that Mahmoud Abbas and Benjamin Netanyahu are far from being friends, when came the time to march in Paris in 2015, they both showed up, and even if there was a hint of hypocrisy from Abbas who clearly supports terrorism, he was still in the midst of an international historic moment. It should now be clear that the Israeli/Palestinian conflict is much more than a land issue. It is not and never was about Israel occupying Palestine. Rather, it is about the simple goal of completely erasing the Jews and Israel from the face of the earth. How would you explain the fact that the simple display of a flag amidst a myriad of other flags would provoke pro-Palestinians to rip and/or cover the Israeli symbol? Frankly, in a normal world, these displays of hatred would be singled out and rebuked immediately, and even more so in the context of the aftermath of a terror attack like the Brussels airport and subway attacks. But we do not live in a normal world. We live in a world where the victims are made into perpetrators and where more and more people worship death more than they value life. Apparently, Israel bashing now supersedes any international display of unity in honor of terror victims. Hiding or destroying the Israeli flag as if Israel was somehow guilty or involved in the recent terror is beyond despicable. Please do not go on telling me that the Palestinian narrative is one of justice, human rights and tolerance. Where was human decency, and more tragically where was human outrage for such acts of pure hatred? I trust our elected leader, Mr. Obama, has it right: if we ignore Isol they will eventually go away. And if we simply call them “Cowards”, that is enough. Mr. Obama also refuses to label anyone or any group as “Radical Islam” and we never speak poorly of Muslims. Mr. Obama…the people’s president…twice. Twice he won the Electoral Vote and the Popular Vote. And like it or not if he could run again in 2016, he would easily win again. This is the country we choose to live in, this is AMERICA! Obviously, you have been brainwashed. Never, ever has it worked to ignore evil. If we don’t do something, more of our friends are going to die. Inaction does NOT work! I love Israel, and if I could, I’d make her my second home. My Jewish brothers and sisters and their safety are important to me, and I care greatly about them.